Escape the Cape weekend is a big one in Cape May. Several thousand competitors descend upon our fair town, biking, running, and swimming in some of the most beautiful terrain you’ll find in competitive triathlons. We’re thrilled to be part of it each year, brewing a special beer — Escape the Cape — to mark the occasion. This year will be truly something special — three members of the Brew Crew have agreed to run a relay team for us! We got together with Paul Greer, Lauren Frech, and Caitlin Gard to get their thoughts on swimming/running/biking their leg of this award-winning triathlon. We were hoping that we could find someone at the brewery to take the plunge and run the full triathlon, but we couldn’t find anyone that determined. So, you’ve decided that you want to jump off a Cape May-Lewes ferry. Maybe you’re an adventure-seeker, maybe you’re a flotation device tester, maybe you’re just a little bit loopy on bus fumes. For whatever reason, you’ve decided that a 12-foot plunge into 65° water is in the cards for you. However, if it’s something you’ve been wanting to do with 1,750 of your now-closest friends, followed by a five-mile run along the North Cape May beaches, then a ride on your trustiest bike for 23 miles, you should probably do so as part of one of the best triathlons in the nation: Escape the Cape. Because, if you’re a competitor, you get to attend a killer after-party and sample one of the most refreshing beers you’re likely to find: Escape the Cape. 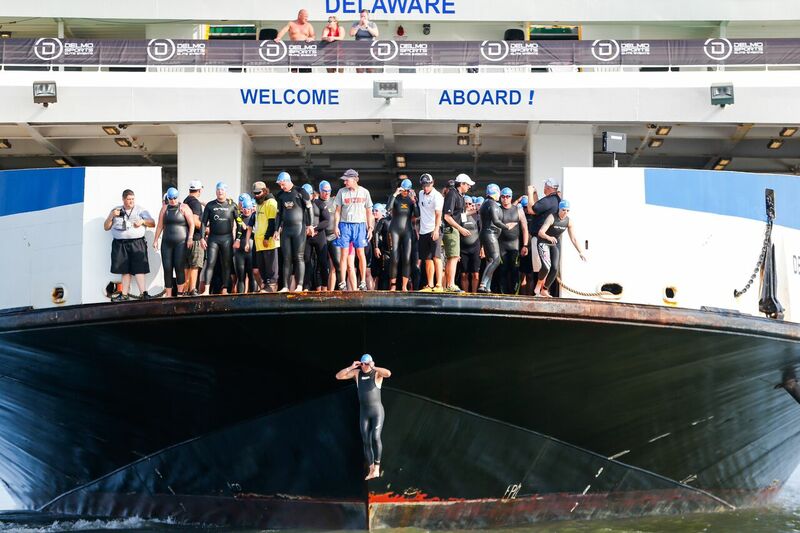 It’s our fourth year sponsoring DelMo Sports’ insane triathlon, Escape the Cape, which sees its nearly 2,000 participants plunging off the back of one of our iconic Cape May-Lewes ferries. That also means that it’s our fourth year brewing Escape the Cape Pale Ale. It’s brewed with assertive and exotic hops and fermented with our house Lager strain, but its wake-up punch of hops hits you right in the face with a strong hop aroma and little bitterness. It’s crisp and dry, ridiculously refreshing, and perfectly sessionable. It’s what everyone is looking for when they cross the finish line. We decided to check into Untappd to see what everyone had to say about last year’s brew. Generally speaking, when you’re riding the Cape May-Lewes Ferry, you’re asked to remain aboard the ferry until it has docked safely at your destination. That’s typical ferry-riding etiquette. It’s safe, it’s sane, it’s… what normal people do. Unless you’re one of the 1,750 people participating in Escape the Cape. 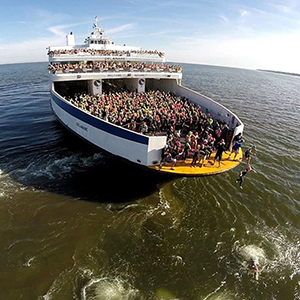 On Sunday, June 12, this award-winning triathlon commences with the entire group of participants plunging into the Delaware Bay from the back of a ferry. To say the least, it is an evocative moment. 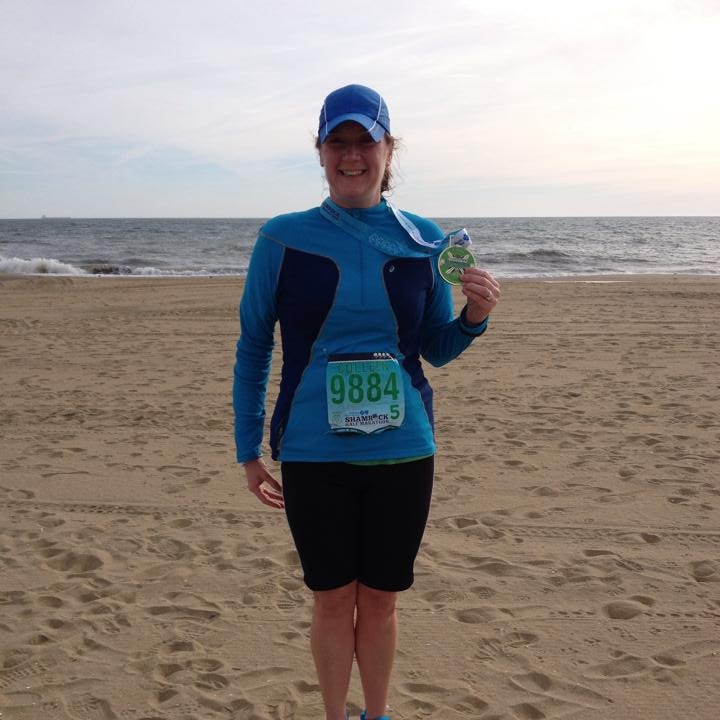 We sat down with Maryland-based triathloner Colleen McGuinn — wife to James, mother of two, prosecutor par excellence, Villanova grad (go Cats! ), and general, all-around badass — who is participating in the race for the first time this year. Colleen ran her first triathlon in 2001 at age 26 — “It was an excuse to hang out at the beach for a weekend,” she says (If you need an excuse to hang out at the beach for a weekend, call us, because we have about 23 on tap right now….). Colleen has been running seriously since 2012, training for triathlons by adding biking and swimming to her usual running routine. She’s run some pretty hefty races since then — Ironman, anyone?!? — and can’t wait to take the plunge for Escape the Cape. 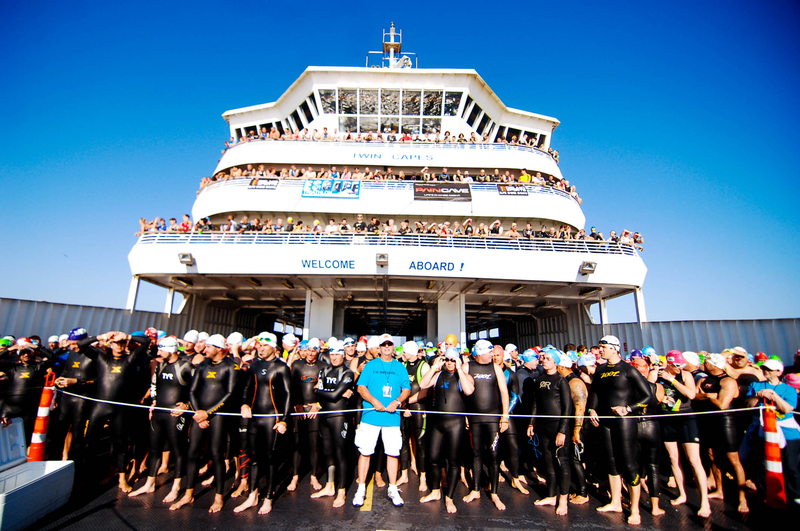 This year’s race involves competitors swimming a mile, biking 25 miles, and running five miles. Let that sink in for a moment. Most of us don’t even like driving 31 miles — these people do it under their own power… for fun. CMBC’s prez, an avid biker himself, was all set to participate in the race two years ago before falling victim to a run-in with a razor blade and some zip ties while installing a projector. “And it gives us an reason to brew a special beer.” As if we need a reason. Brewed with assertive and exotic hops but fermented with our house lager strain, Escape the Cape Pale Ale is a straw-colored, lager-esque ale, crafted to appeal to beer drinkers yet be invigorating enough to sip after a running a triathlon. This brew has a strong hop aroma with little bitterness: crisp, dry, and poignantly refreshing. Colleen, Stephen, and the rest of the runners will be able to sip Escape the Cape at the pre-race party at the Tasting Room on Friday, June 10 from 5-7 pm and at the post-race party at Harpoon Henry’s after the race on June 12th from 11am-2pm. Escape the Cape taps Thursday, June 9th in the Tasting Room and in better bars and restaurants throughout the area. Best of luck to Colleen and all the competitors this weekend! On this island, it’s hard to throw a Cape May Brew Co frisbee without hitting a person exercising. There are runners on the promenade. Surfers on the beach. Even a retro rollerblader or two weaving throughout the historic district. And to cater to all of the athletes, there are races. Boy, are there races. We’ve got turkey trots, glow runs, nun runs, a Run to the Taproom 5K, even the Ocean Drive Marathon which kicks off here every spring. not anywhere. It’s why we’re so proud to be among the sponsors. Now in its third year, the event — comprised of a sprint triathlon (.35-mile swim, 12.5-mile bike, 5k run) as well as an international triathlon (1-mile swim, 25-mile bike, 5-mile run) — requires participants to jump 12-feet from the deck of the Cape May-Lewes Ferry into the Delaware Bay for the first leg of competition. 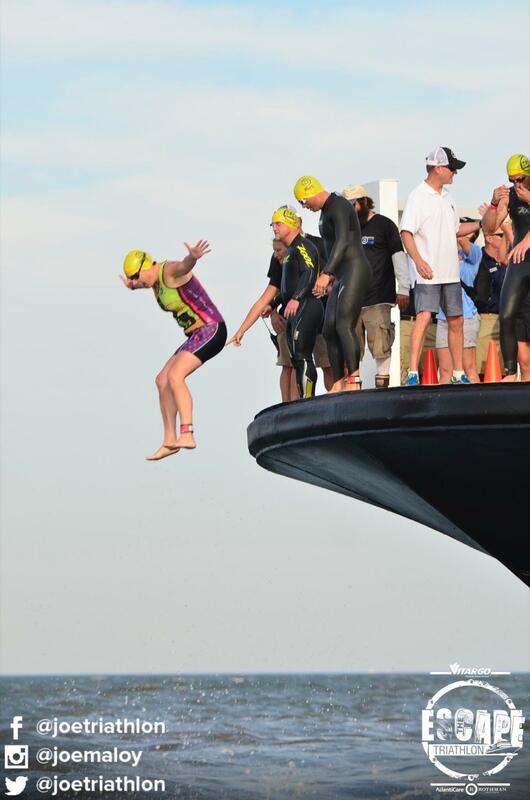 At 8am on June 14, a record 1,700 athletes will take the plunge. Some of them will require the coaxing of a certified sports psychologist. Don’t worry – no one’s been injured in the race’s history. Save for our President Ryan Krill, who was set to participate in last year’s event until, just prior to the race, he nearly sliced off his thumb while installing a projector in the CMBC tasting room. You think jumping from a ferry is tough? Try balancing over a bar while cutting zip ties from a conduit. Anywho, immediately following the competition will be an after-party at the ferry featuring barbeque, lawn games, and a special Pale Ale brew from yours truly called, appropriately, Escape the Cape. As for the beer itself? So there you have it: a badass race and some badass beer… not a poor way to spend a Sunday. 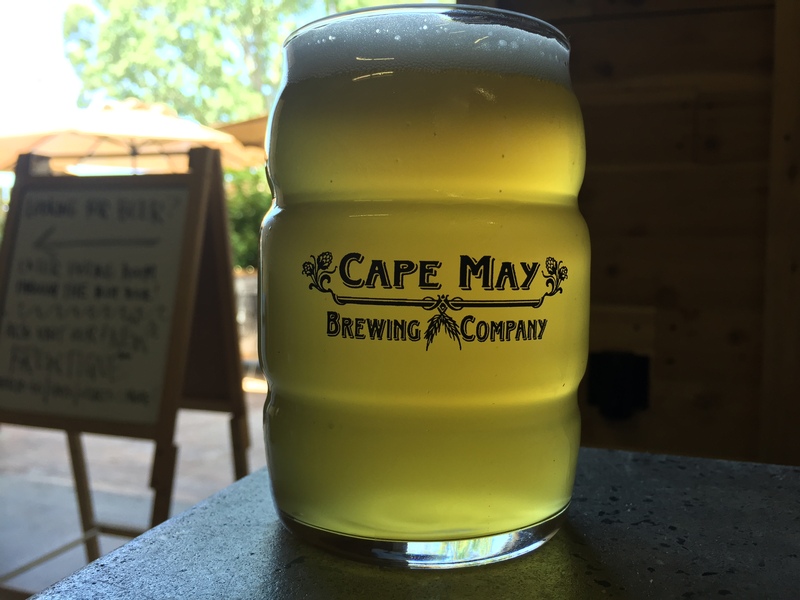 Of course, if you can’t get to the ferry for the big event, we’ll be tapping Escape the Cape in the tasting room on Friday, and pouring until we run out.